Black Friday Bobbie | We Like to Cook! Okay, for some us, the thought of eating more turkey is repugnant, but for the “bona fide golly turkicanis freak,” there is no such thing as too much turkey. The sandwich, made famous by Capriotti’s Sandwich Shop, was voted the Greatest Sandwich in America by AOL’s Lemondrop.com in 2009. “The Bobbie” (Thanksgiving dinner in a sandwich) is a year-round favorite in Las Vegas where it is reputed to be the best way to recharge after a late night out on the town. Split the sub roll lengthwise and spread a light coating of mayonnaise on each half. 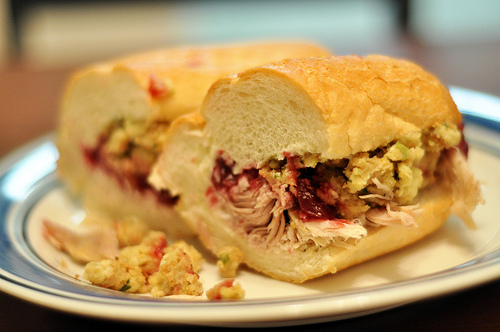 On the bottom half of the roll, layer the turkey, stuffing, and cranberry sauce, and salt and pepper to taste. Cover with top of roll, slice in half, and serve immediately. This has been a family favorite for years -- and we'd not ever heard of Capriotti's!